E & R's Travels: And Around and Around we go!! Excitement in the Air! And Around and Around we go!! Excitement in the Air! Around and around we go-on the mower!! I haven't been blogging regularly-and I won't even bother to make excuses for myself. Theres not a lot new here just busy days of the same old same old and I sure don't want to bore you all, repeating the same thing over and over, I can't even seem to make it interesting for you. I envy those of you who keep up your blog daily and are able to make it so interesting! I guess my talents lay elsewhere. And writing isn't one of them..(nor is my singing - but don't tell anyone)! I trust all of our Canadian friends had a nice July 1st and our American friends had a wonderful day, celebrating today. 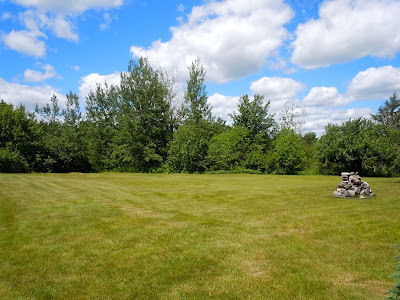 We left home last Friday morning and headed up to the cottage for the long weekend- to get the mowing done, and spruce up the property up there. The weather was gorgeous and we put in a full day mowing. When Rick wasn't on the ride on I was - that poor old mower never stopped and we accomplished our task by Friday evening. Our lawn is 4.5-5 acres of mowing..ugh...but its so pretty when its all done. The header picture is a snap of 'some' of the field. 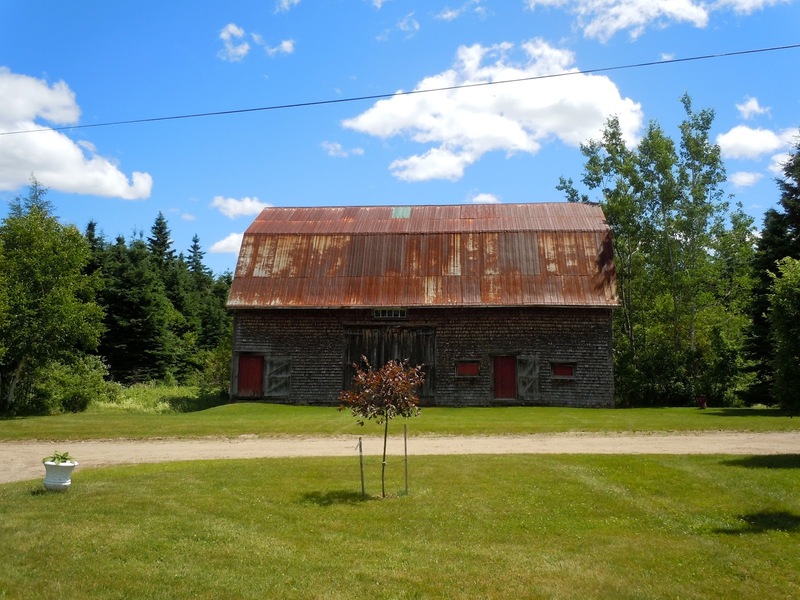 This barn is across the road from the cottage and was built many many moons ago by Rick's grandfather-long before Rick's time. And Rick's mom who was 94 when she passed in 2010 never remembered it not being there, so we have no idea how old it truly is. We store our 4 wheelers etc in there-there is a nice babbling brook down behind the barn-good fishing - if this barn could talk we would hear some wonderful stories. This property was Rick's mom's homestead where she was born and raised. The original house is now gone but we resurrected a cottage/camp of sorts remodeling the old grainery. 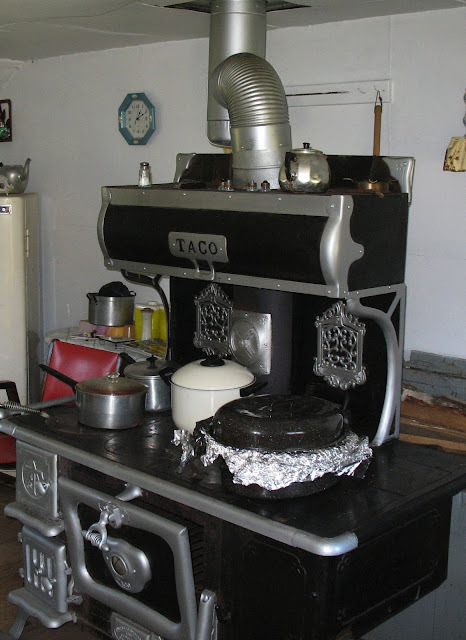 Now here is a piece of history-this old wood stove is in our cottage and it has cooked many good meals and kept many family members warm for the last 4 generations. It belonged to Ricks grandmother and she cooked on it for many many years before her passing in 1951-and in the winter I cook on it today. We also have an electric stove for the spring and summer months..
After the mowing was accomplished it was time for happy hour. Our sons arrived on Saturday with their guitars (beer) and instruments, and stayed until Monday. We loaded up the table with good food, and celebrated a friend's birthday. The place was never empty- so needless to say we all had a great time. The music was excellent as was the company and we enjoyed many good belly laughs with the boys and their friends...they are definitely comedians. And charmers, as some way- some how all those kids had Rick and I, bbqing hot dogs for them at 2am Monday morning. Sunday night we enjoyed a show of fireworks in town, then when we got back to the cottage the boys put on another show as they had brought fire works with them. I just love being close enough to smell the fireworks. Monday afternoon we all tiredly (is that a word?) packed up and headed home and I dove into the laundry and cleaning up the mh from our weekend away. sounds like you have been busy!..nothing wrong with not blogging everyday!..hope you have some fun with Ralph and Donna! 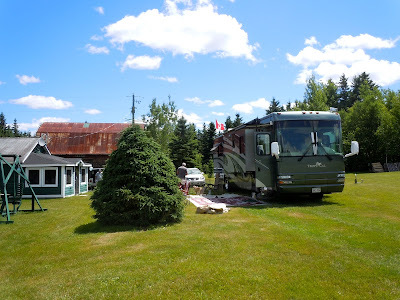 !..I am sure there will be lots of topics for blogs as long as they are parked in your 'rv park'!! I love that property. It looks like a park setting. The remodeling job is fantastic. I think mowing that yard would be worth the beautiful of the surrounding scenery. Why is it that beautiful property takes so much work to keep it that way? Ugh! Love the stove, a real piece of history and it still works...wow! 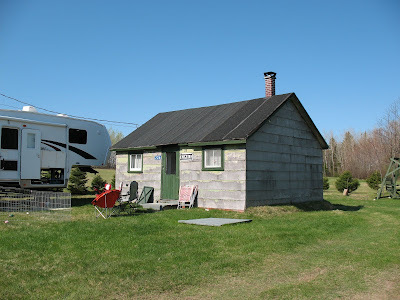 Beautiful piece of property and that woodstove is a treasure. Bet it is wonderful in the winter. Love that stove. Had one in our old house back in Nova Scotia, and my brother still has one in his place to this day. It's not the only stove they have though. It's just a bit of work keeping one of those things going. The heat from it in the winter is the best ever, and very hard to explain. Not sure I'd want to be cutting all that grass, but at least the mower is doing the running around. Your weather looks like it's taken a turn for the better. Hopefully it'll continue to be great for the next little while. Seeing your cottage and beautiful property makes me think more about doing the same. Once in a while my husband and I talk about doing that but it hasn't become a reality yet. Such a wonderful long weekend and great fun. Sounds much like ours including the lawn mowing. Great fun and late nights. Makes us remember why its nice to help out other people and not own our own acreage anymore. Such a beautiful piece of property and a peaceful getaway. I love that stove and bet it is so neat to cook on/in it. Glad you had such a great weekend! 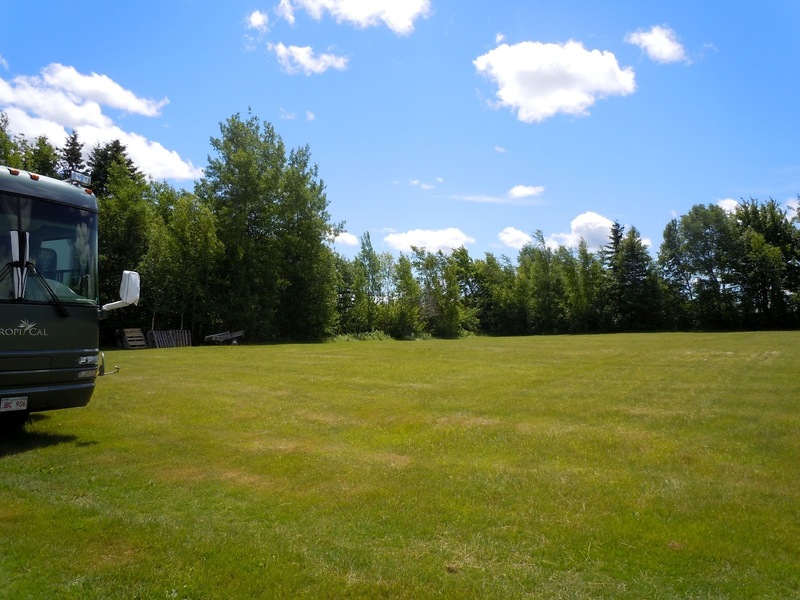 Great work with mowing that large a property. But, it was worth it for the gathering of family and friends. That the property has been in the family for such a long time is great too. What a great post!! You don't have to post everyday, it is not suppose to be a chore. 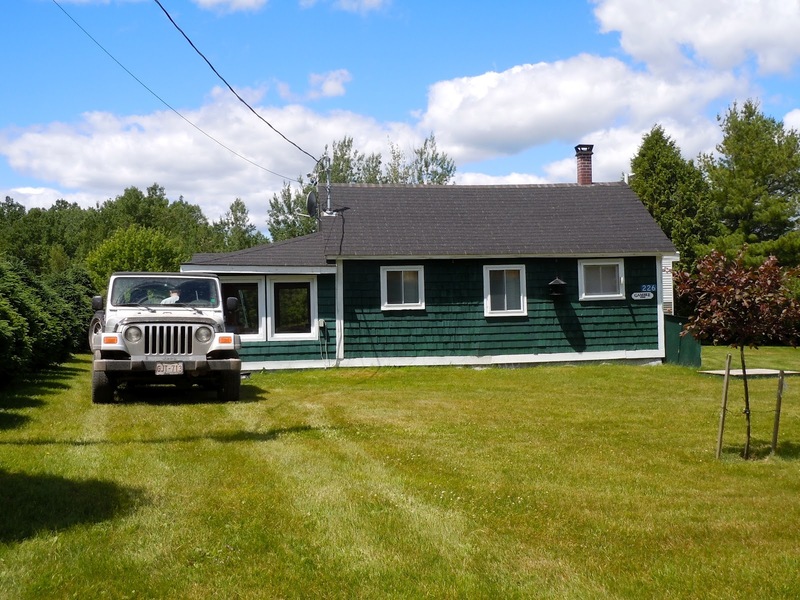 Loved your before and after shots of the cottage. What a great area you have and so full of wonderful memories. Are there bedrooms in the cottage for the boys? Or do they RV? I would have loved to be there for the music. LOVE LOVE LOVE that stove!!! Great post, Elaine and NOTHING at all boring about it. You sure have a beautiful piece of property and everything looks so well kept up. That old barn is a beauty as is the old wood stove. Looks like you're in good shape for greeting your friends. It does look like a piece of heaven. I love that stove.